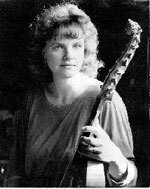 Catherine Mackintosh was one of the first of her generation to specialize in early string-playing techniques. After a conventional violin training at The Royal College of Music in London she took up the viol and baroque violin and was immediately in demand from such pioneering groups as Musica Reservata, The English Consort of Viols and The Consort of Musicke, with whom she sometimes played up to seven instruments in one concert! Catherine was appointed leader of The Academy of Ancient Music in 1973. During her fifteen-year tenure she made countless recordings. Since the foundation of The Purcell Quartet in 1984 Catherine has concentrated more on solo and chamber music and has recorded Bach concertos for violin with The King's Consort for Hyperion. As professor of baroque and classical violin and viola at The Royal College of Music since 1977 she has passed on her enthusiasm for early style in performance to countless younger musicians and is frequently invited to direct workshops and give masterclasses. She is visiting professor of baroque violin and viola at The Royal Scottish Academy.